The strangeness began in 2013. 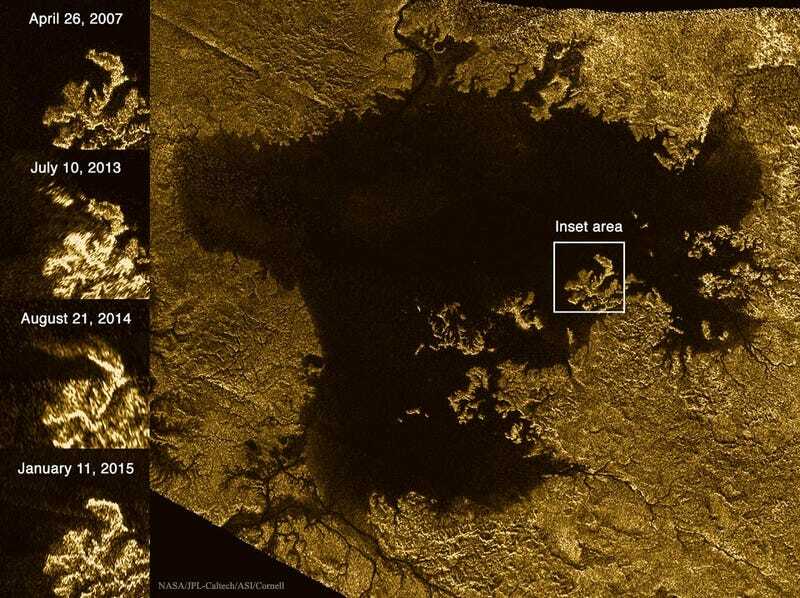 The Cassini spacecraft had just spotted glimmers on the surface of Ligeia Mare, a vast hydrocarbon sea located near Titan’s north pole. The glimmers weren’t there in 2007, and by 2014, they had disappeared again. Then, in January 2015, Cassini skirted the north pole of Saturn’s cloudy moon once more, and the glimmers were back. We’re still not sure what they are, but scientists are now proposing an amazing hypothesis. They could be tremendous methane waves. What we do know about the glimmers—recently dubbed “magic islands”—is that they must represent topographic changes. Cassini “sees” through Titan’s thick atmosphere by bouncing radio signals off the moon’s surface and timing their return. In this analysis, flat areas appear perfectly dark and smooth, while rough, bright regions indicate bumpier surfaces. Beyond that, we have very little information on the ephemeral glimmers. But if scientists had to guess, they’d say we’re looking at waves. Writing recently in the journal Icarus, Jason Hofgartner and colleagues demonstrate that it would only take a faint breeze to ruffle Titan’s glassy oceans. The glimmers could also represent bubbles of sea foam or some sort of floating solid. Not much floats on liquid methane, though who’s to say there isn’t some wacky alien biology perfectly adapted to the -179 degree Celsius surf? We may have to wait until April 2017, when Cassini makes its final close flyby of the Saturnian moon, for the full answer. In the meanwhile, surfers can now dream about catching a wave on an endless sea illuminated by Saturnshine, that tremendous ringed gas giant suspended just over the horizon.